Yup. 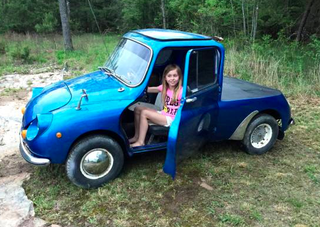 It’s a Subaru 360 Sedan-amino. I don’t know what genius constructed this, or what possessed them to do it, but let’s all thank the supreme Jalop deity Yahmanualbrownwagonweh that it was done. And it can be yours for a somewhat reasonable price. There’s not really a bed, but that can be easily rectified with a little sheet metal, or even just a sheet.